If you’ve gotta run the wheel, you might as well do it in bare feet. Many of us are so busy being good little hamsters that we never have face time with green space. 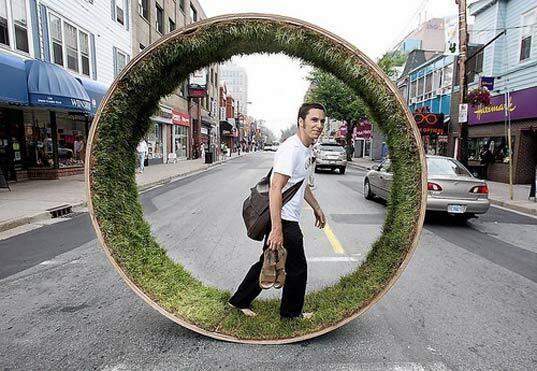 A group of students from Dalhousie School of Architecture — David Gallaugher, Kevin James, and Jacob Jebailey — decided to remedy this problem with a street-ready grass-lined wheel. The wheel is of simple construction–just plywood, mesh, fishing line, and sod–but it’s loaded with meaning. On one hand, it’s a playful protest to the lack of public green space in Halifax. On the other hand, using sod for their material offers a deeper critique on urban greenery. This project reminds us of Rebar’s PARK(ing), which turned metered parking spaces into temporary parks. Both concepts point out not only on our lack of interesting green space, but also our lack of time to enjoy them. We’re huge fans of urban intervention as a means of shaking up normalcy and calling for a change. how do you turn the thing? Might be a little difficult to see where you’re going. ?? That's cool. I need one..
gabby i beat you to a second comment on this wonderful grassy page. hey this is cool . word! to your mother... earth! i see that someone named asher listed the three other people that worked on the project WITH him and i see you went back and edited so that their names were in there, but i believe you forgot the person who mentioned the other three students. you should be crediting FOUR students plus one other person who took the photograph. Looks like their name is Asher DeGroot. Crediting people is important. This is an excellent invention,though how owuld you see and also you could put it in your wrk if u just want to walk for a little by attaching some sort of hinges or something so it would still rotate but in place. That is genius... I live in montreal but right now i´m visiting Colombia... And i tell you a wheel of grass here would be a boom! wow genius! Cheers! Dan. If gas prices go up any higher... I'm getting one. How does one turn? Or does one just roll over any obstructions such as buildings, cars, people, small animals . . . .
i love bioneers, artists and canadians.